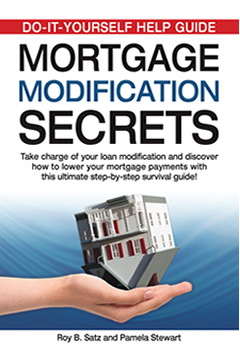 Solutions Press of Newport Beach, CA has published its latest book, Mortgage Modification Secrets, according to Lee Pound, publisher. The book, by mortgage and financial experts Roy B. Satz and Pamela Stewart, now available online at www.modsecrets.com and at Amazon.com, is designed to help homeowners in trouble with their mortgage loans. It offers a step-by-step method homeowners can use to file and pursue a modification to their mortgages. It also provides answers to the numerous questions homeowners have who are facing financial difficulty. ?Modifications are common today because many homeowners have no other options readily available to save their homes,? according to Satz. "Because of the numerous applications received by lenders, changes and unique guidelines placed by lenders, and inefficiencies created from the mass influx of applications received, it is a daunting task to apply for a mortgage modification"
?Homeowners are not guided in any direction as to how to complete this endeavor,? Stewart says. ?The number of modifications received by homeowners is only a fraction of what it should be.? Mortgage Modification Secrets gives homeowners the guidance they need to complete their modification and, equally important, shows them what to expect during the process. Both authors have extensive knowledge of the mortgage industry. Satz, now retired, held positions at publicly traded banks and financial institutions in mortgage underwriting, sales, training and origination for over 30 years. He has also established a loss mitigation company that has successfully modified mortgages for hundreds of clients. Stewart?s 20 years of experience includes working with the country?s leading lenders as a mortgage broker obtaining mortgage modifications and short sales for clients throughout the United States. Her focus continues to be on streamlining the process with lenders in order to allow homeowners to efficiently achieve successful results. ?We published this book,? Pound said, ?because 25% of homeowners are now facing default or are already in the foreclosure process. Mortgage Modification Secrets provides the tools for homeowners to reach the goal of a successful modification and to give options to those who seek alternatives. ?